This year I was in Verona to see Jose Cura as Canio in Pagliacci. A role I have seen him twice before. But this was a new production in Arena di Verona. And going to Verona is such fun. There was rumor that not many from the Jose Cura connexion (JC's fanclub) was going to be there, but I counted 7 persons at least. Since I had decided to go to Verona I and MARCELO ALVAREZ was going to sing in Tosca I wanted to combine these two great Argentinean tenors. I so it was Cav/Pag on July 14th and TOSCA on July 15th. Better still; I hear that Cura was also going sing Turriddu in CavRust, my first with him in this role?! And then RUGGERO RAIMONDI as Baron Scarpia. My expectations skyrocketed. O dear, major disappointments is at hand if something goes awry. This time I came my destination the day before the opera. So on Thursday the 13th I was resting up to be in the very best mood and hopefully not sleepy when the operas begin. No problem in Verona, although it is very hot. But in the evening when the operas begin it is better. No need really to carry along a jacket even long after midnight it is still hot enough to go without. CAV/PAG with Jose Cura was wonderful. One disappointment: where is Cura when we are waiting at the stage door. GONE?! Luckily after TOSCA this never happened, both ALVAREZ, RAIMONDI and Cedolins was there. And of course RR fans and Alvarez fans. TOSCA was incredible, FANTASTIC. Now comes the hardest part of this report from Verona; how to describe such a wonderful performance, the amazing acting, singing and this production. I will try, although many before have done a fabulous job in making a review of this TOSCA. As you can see from the photos this is a beautiful production. And when I see them I remember the most glorious singing. And Marcelo Alvarez had a golden voice and so in character. Fiorenza Cedolins was a good Tosca but I must admit I was more looking at Cavaradossi than Tosca. But to start with the beginning. Angelotti (Marco Spotti) comes in near exhaustion. Really great acting even though the stage was not really having a Madonna stature where Angelotti could find the keys or where Tosca could put her flowers. But that didn't matter the great acting made up for that. Later came the Sacristan (Fabio Previati) with several monks, and in this production the monks was almost for laughs and not the sacristan. 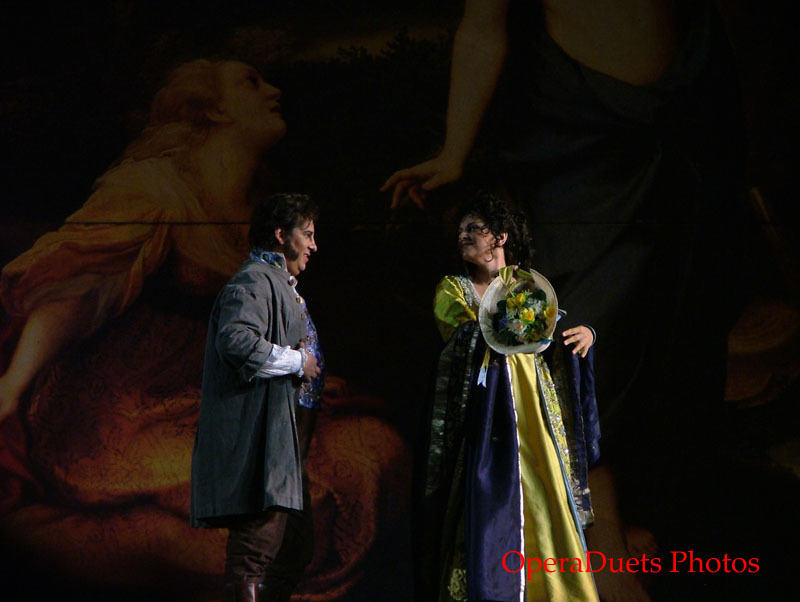 Then came the moment, Mario Cavaradossi (Marcelo Alvarez) came onstage. Glorious singing and acting. Marcelo Alvarez was completely in role. This role fits him like a glove. Wonderful Recondita armonia!!! Then he met Angelotti again and the story becomes serious. This Cavaradossi is serious in his political convictions, Se la vita mi costassi!! !, Alvarez is singing and it is going out like a rocket. Tosca is singing "Mario! Mario! Mario!" As Angelotti hides, Cavaradossi answers Tosca. Tosca (Fiorenza Cedolins) arrives and of course this is one of the opera literature most beloved opera duets, wonderfully sung by Alvarez and Cedolins. Her acting and singing makes her believable as Tosca. Alvarez is naturally showing why he is a No 1 tenor in the world. Now, the only thing is that the audience thinks Tosca's jealousy is just a laughing matter. I don't, jealousy is not easy for the jealous person, and not for the partner. I loved how Marcelo made his Cavaradossi such a caring and lovable person who know how to make Tosca's life better in spite of her jealousy. So I saw in Verona how this love duet showed the depth of their relationship, deep love. One highlight was naturally "Qual occhio nel mondo al par de tuoi". Incredible acting and singing. At last Tosca is going, "Urge la opra!" In don't know why there were laughs when Cedolins was going. May be it was the "Falle l'occhio nere". Then we see the soldiers in Castel Sant'Angelo (high up in the steps) they have found one prisoner missing (Angelotti), and a COLPO di CANONE. And there where quite a few laughs (almost hysterical) at the real BANG of the Cannon. And it was LOUD, and of course you could see the smoke, and not little of that either. Then of course on the stage Angelotti and Cavaradossi flees. The Sacristan and the chorus is ready to celebrate the big victory against Napoleon. The Sacristan had wanted to tell of this victory against Napoleon to Cavaradossi to show him "We win, you loose!" Now it is time for Baron Scarpia (Ruggero Raimondi) and his spies to search the church. And the big painting. of Maddalena and the Christ was into two pieces. And I guess somebody in standing on this robe or maybe it is the painting. Ruggero Raimondi tries to stand up twice, then as the smart artist he is he starts singing kneeling, making that so right so natural and so right in character to sing "Un tal baccano in chiesa!". With the help of his spies and with no loss of dignity he goes on, owning the stage, domineering and scaring the wit out of the sacristan. Of course Scarpia figures out what had happened from the evidence. A empty bucket in the chapel (Cavaradossi's food prepared by the sacristan, C was not hungry, and now the it inside the Attavanti chapel), Attavanti's portrait by Cavaradossi (she is the sister of Angelotti). Scarpia is lusting for Tosca and now her lover is evidently helping a State Enemy). YES, Tosca will be mine. Then Tosca arrives. Scarpia found a fan belonging to Attavanti in the chapel. But he tells Tosca he found it near the painters pencils etc. Fiorenza Cedolins is a Tosca only looking for Cavaradossi so Baron Scarpia being there is not something she is thinking about. But when he will give her, a devout Catholic, holy water she can only accept, absentmindedly. Then when Scarpia starts his insuating. Making her believe that Cavaradossi is in their love nest with Marchesa Attavanti, she is all fire. Just what Baron Scarpia wanted and he orders "Una Carrozza, tre sbirri" and the Te Deum begins. And it is really BIG, BIG, BIG in the Arena. Even almost overwhelming Ruggero Raimondi. TOSCA, ACT 1: Incredile ma vero! This is the act that most define Tosca and that is saying without a great Scarpia and Tosca it will fall apart. Of course Ruggero Raimondi is the man to ensure that this act will have all the drama it need. And Fiorenza Cedolins is enough of a Tosca to really ignite the fire it need. It is going to be impossible to describe how fantastic this act was sung and acted. My photos from act 2 really says better than I can do what a dangerous situation act 2 was. And Marcelo Alvarez sang so splendidly E lucevan le stelle that the whole arena wanted to have it again. And after a false start "O dolci mani", Marcelo Alvarez was obviously already thinking ahead. Both E lucevan le stelle was the kind of singing that should become the standard. 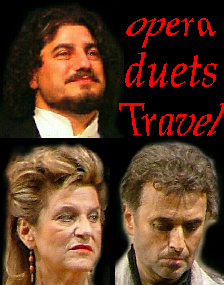 Fiorenza Cedolins and Marcelo Alvarez was both singing their best duet ever, it was THAT great. The acting was outstanding. Then unfortunately the opera would be over with the death of Cavaradossi and Tosca. WHAT A PITY that it is not a longer opera. BRAVA, Cedolins! BRAVI, Marcelo Alvarez & Ruggero Raimondi!!! It was like a dream come true. After all the applause it was time to go to the stage door. Waiting a long time, but it was worth it. Alvarez, Cedolins and Raimondi came out, the boy soprano too and many more. I had almost nil change to get a photo of Cedolins, that was because the world wanted ALVAREZ and RAIMONDI. Ruggero Raimondi tries to get out quickly, but luckily I got some fine photos of him. AND then I got PLENTY of Marcelo Alvarez. And another time I hope to get a chance to talk more to Canterbella, Davina and maybe even Christine. And it could have ended there but no. I and my Japanese friend was following Marcelo Alvarez. Marcelo had promised her to meet his son. And now another kind of magic started. We followed Marcelo with his little troupe, and there he was standing in the middle of the piazza and applause just started impromptu. We walked closed to one of the many cafes, more applause, BRAVO!!! !, people wanted to have his autograph, being photographed with him, congratulating him. So many hugs our dear tenor gave, and so gladly, laughingly. Yet another Cafe, the same happened, all in the Piazza Bra loved Marcelo Alvarez, he talked and waved his hands. It was Magic. And in the end my Japanese friend got to talk to Marcelo Alvarez young son. Who was like his father a gracious being. And he also gave his autograph just like his father. Just before leaving him to eat with his family and friends in a restaurant just a few steps from Piazza Bra I got the chance to thank him for a wonderful Tosca, and in the end I say !Viva Cordoba! in what I hoped sounded Spanish. And he asked me where I was from, I said Norway. And I have been trying to get my sleep back ever since then.